Please send your samples in small boxes instead of envelopes to protect the samples. For water samples – Use a small vial with no prior use. Fill to the top with no headspace. Send to the lab in a sturdy cardboard box with sufficient packing to prevent breakage during shipment. Note – Our laboratory also provides d13C and d15N measurements in conjunction with Carbon-14 dating. We routinely provide d15N testing on bone collagen. For other material types, please contact us for discussion. 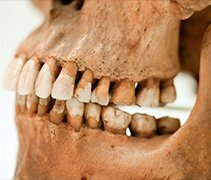 Our AMS dating fees for bones are inclusive of d13C measurements, d15N measurements (except cremated bones), quality assurance reports, calendar calibration when applicable, and 24/7 web access to past results and pending analyses. Collagen extraction fee applies in addition to the standard price. If the collagen is not suitable for radiocarbon dating, the analysis can be cancelled. The d13C and d15N ratios are measured using an isotope ratio mass spectrometer (IRMS). We may not be able to provide d15N measurements for charred or burned bones depending on the sample quality. Please contact us before submitting burned bones. The following are minimum size recommendations and may not prove to be sufficient in every instance. If you are submitting samples for both d13C and d15N analyses, please double or triple the weights specified below. Please use this online form when submitting samples for either d13C or d15N analyses NOT in conjunction with C14 dating. Please contact the lab if you are in doubt about the suitability or weight of your sample. * Minimum quantity requested is 300 μg of carbon after pretreatment. ** This is the recommended quantity. For minimum amount, contact us for discussion. *** Use small vial and fill to the top with no headspace.